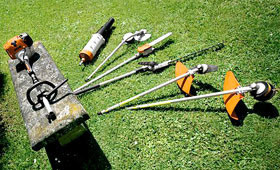 The STIHL KombiSystem is a complete family of multi-task tools composed of different power heads and numerous attachments. The split-shaft design lets you quickly and easily change attachments. First, choose the KombiEngine best suited to your required performance from our range of four drive units: the KombiEngine KM 56 RC-E with easy starting function, the more powerful KombiEngine KM 90 R or KM 110R or the top of the range KombiEngine KM 130 R. All but the KM 56 RC-E (stratified scavenging) are equipped with the revolutionary STIHL 4-MIX engine. Then, you can choose which one (or more) of our attachments you wish to use with it. 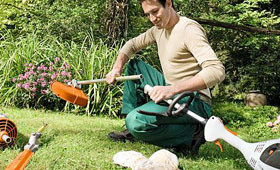 As your landscaping needs change, you can expand and adapt your KombiSystem with the attachments required. Your STIHL authorized dealer will be happy to help you and can also supply all available combinations. KombiEngines are available in five power versions: the KM 56 RC-E with easy starting function, the more powerful KombiEngine KM 90 R, KM 94 R, KM 110 R or the top of the range KombiEngine KM 130 R. All but the KM 56 RC-E and the KM 94 R (stratified charge) are equipped with the revolutionary STIHL 4-MIX engine. FBD - KM bed re-definer - New KombiSystem KombiTool with rugged construction for maximum durability. With a unique blade design, it provides smooth cutting through existing or new flower beds. FSB - KM curved shaft trimmer KombiTool to improve maneuverability in tight areas with AutoCut 11-2 cutting head for STIHL KombiSystem. All attachments sold separately. FS - KM straight shaft trimmer KombiTool with AutoCut 25-2 head for STIHL KombiSystem. All attachments sold separately.